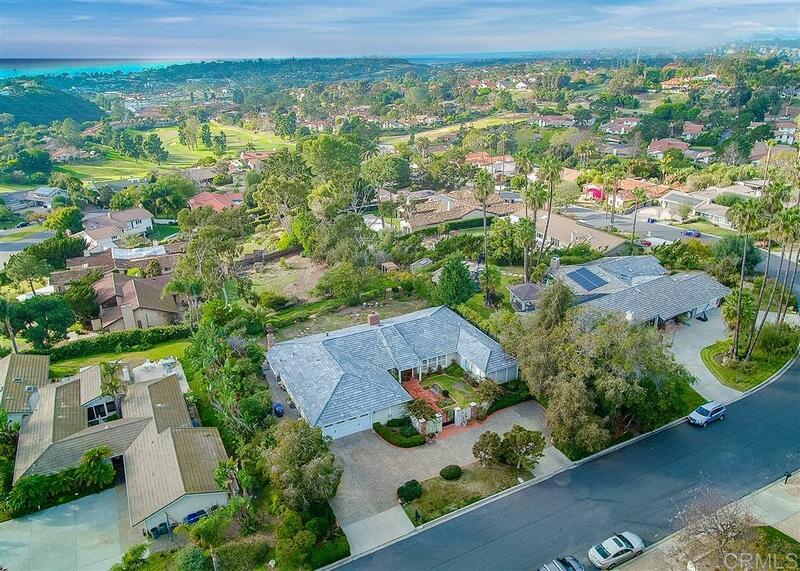 Top 10 Reasons to Love This Home: #1 Classic Solana Beach single-level home. #2 Circular driveway. #3 Tranquil & secluded on half-acre. #4 Custom architecture with a contemporary flair. #5 Chef's kitchen with professional-grade Viking appliances. Ocean vista. #6 Great Room with vaulted, open-beam ceiling & custom fireplace #7 Generous FR for use as den, office, or library #8 Master suite with recently remodeled bath. 3 ensuite guest rooms. #9 Perfect laundry room. #10 Premiere location. See Supplement., Top 10 Reasons to Love This Home: #1 Classic Solana Beach single-level home design that provides a perfect layout for traditional or multi-generational living. #2 Circular driveway, with extra parking space, opens to gated, private front courtyard. #3 Tranquil & secluded half-acre lot featuring an expansive & level backyard with an ocean vista. #4 Custom architecture with a contemporary flair. #5 A true chef's kitchen with professional-grade Viking range/oven & refrigerator. Full ocean vista from the kitchen & French doors leading out to the back yard. #6 Home features a spacious traditional living room with vaulted, open-beam ceiling, grand fireplace, & ocean vista. Included in this Great Room is a dining space suitable for large gatherings. #7 Generous family room off living room for use as den, office, or library â or all! #8 Master suite with recently remodeled bathroom installed by Coastal Design. Three ensuite guest rooms that all look out onto landscaped courtyard. Four bedrooms in total - all with generous closets. #9 The perfect laundry room/mudroom. #10 Premiere location in sought-after Isle Verde community on the cusp of Solana Beach, Del Mar, & Rancho Santa Fe. Close to Lomas Santa Fe Country Club, executive golf course, park, walking, & shops. Minutes to beach.